Will Social Security Be There When You Retire? Home › Retirement Planning › Will Social Security Be There When You Retire? It’s become almost fashionable these days to talk about the impending bankruptcy of Social Security, as if its demise is all but a done deal. But is that even the case? Will Social Security be there when YOU retire? And how should we plan for what ever we might expect to get from the system when our turn at retirement comes along? Let me state at the outset that I’m not a blind optimist cheering on the “company line” about Social Security as if dark clouds weren’t looming on the horizon. The fiscal ship that is 21st Century America is not an enviable one and the bill will certainly come due either gradually (let’s hope) or suddenly, but either way Social Security is likely to be there in the future—in some form or fashion. People speak almost casually of the bankruptcy of Social Security, as though the program exists in a vacuum where it can quietly implode without any collateral damage to the rest of the government or country. But what would happen if it did? To believe that Social Security will disappear is to predict the collapse of the entire federal government. A Social Security bankruptcy would almost certainly be part of a much larger general bankruptcy by the US government. The same government that issues monthly checks to senior citizens also funds national defense, interest on the federal debt, various forms of welfare, transfers to the states, foreign relations and the administration of justice, among others. If it can’t afford to pay out Social Security, it won’t be able to cover all the other programs either, at which point it no longer exists as a practical matter. Social disorder. Social Security is the largest of the entitlement programs and in a very real way it’s the bedrock of all of them. Much of government legitimacy rests on monthly checks to retirees and if that were stopped for any reason the trust the citizens place in the state would evaporate. The implications for general social order could hardly be measured, but we can fully expect that it won’t be pretty. The affects on the already battered housing sector would be substantial. 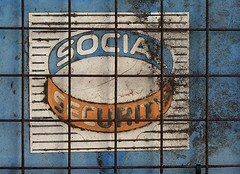 Part of the explosion in the number of households after the second world war can be directly traced to Social Security. With a monthly government check, a company pension and/or a stream of investment income, millions of seniors have been able to live independently of their children or third party care facilities. The disappearance of Social Security would almost certainly cause a massive collapse of the housing market (and its price structure) as millions of households would disappear. Widespread impoverishment of the elderly. For millions of seniors, Social Security is either the largest part of their income or their only income. If it were taken away many would be unable to feed themselves or seek even basic medical care. Those who don’t have family or friends to move in with could quite literally be out on the street; that’s tough enough for the young, let alone for the elderly. Political unfeasibility. Because of all of the above, the political party holding power presiding over the demise of Social Security will be voted out of office at the next election, never to make a significant appearance on the national political scene again. Politicians know this, and will do everything possible to prevent it from happening. I’m not predicting any of this will play out, but I am hoping to show that if you believe Social Security will (or even can) go bankrupt, what you’re really calling for is doomsday. The ramifications of the collapse of Social Security would be so far reaching, so catastrophic, that it would be impossible to believe that the program would go under and leave the rest of the country intact. The same conditions that would eliminate Social Security would be so severe that the possibility of having anything like a functional society—let alone a comfortable retirement—would almost certainly be out of the question. To expect the bankruptcy of Social Security is to believe the United States as we now know it would no longer exist. If after all of that, you still believe that Social Security will go away, you’re best plan of action won’t be to save and invest money, but rather to map out some strategy for radical self reliance. Instead of concerning yourself over the most promising growth stocks or with paying off your mortgage, your time would be far better spent finding some raw land to grow your own food, as well as a power source and water supply to go with it. Beyond that, plan on working until you drop. That’s the kind of world that will almost certainly exist if Social Security were to disappear. Not entirely because the program would no longer exist, but more because of the factors that will have caused it. I’m not certain we can even prepare for that outcome. Now the doomsday scenario aside, what’s a more likely outcome and how should we be preparing for it? More likely, Social Security will be there no matter what your current age. What the Social-Security-is-going-bankrupt prophets miss is that the cost of not having it are far greater than the cost of keeping it. Yet you don’t have to be a prophet to understand that the program is due for a major day of reckoning. It’s probable that benefits will be reduced, made 100% taxable, or we’ll be paid in currency that’s worth far less than it is today. We should expect that there will be some benefit from Social Security, but also that it will be considerably less than it is now, especially in real terms. It’s hard to prepare for a scenario that’s short on specifics, but flexibility and adaptability will be critical. Overall, plan for a lower cash flow at retirement than current retirees are now receiving. Scale back expectations for retirement; plan on being happy even if you won’t own a vacation home in the tropics! If you’re interested in developing additional income streams, either for retirement or to help prepare for it and fund it, check out my posts on freelance blog writing or running an online store. They’re the kind of work and business you can easily run well past retirement age. I’ve kept this discussion restricted only to Social Security, but its sister program, Medicare, may be even more worrisome. What do you think–will Social Security be there when you retire? 22 Responses to Will Social Security Be There When You Retire? Very nice summary of the issues and likely outcome. Also liked your list of preparations. One thought: While you’re preparing for your own retirement with less income from SS, don’t forget to prepare to help your parents along the way. They are likely either collecting SS now, or soon will be, and have much less time to prepare for the inevitable (if hidden) cuts. GN – Excellent point on taking care of your parents. That’s the hidden side of retirement preparations we don’t normally think about–the retirements of our loved ones. That might very well look a lot like the Waltons. Even with Social Security remaining to some degree, the future of retirement may not look anything like what it has in the past few decades. Why is self reliance so radical? Folks used to be able to do so much more for themselves, did we really gain anything by going to work for 50 or 60 hours (counting the commute), versus the local job and the chores around the family plot? Vitaeus – Actually, there isn’t anything radical about self reliance in the bigger picture. I used the word ‘radical’ in a relative sense, meaning relative to the highly specialized one-man-one-job economy we’ve known in recent decades. My grandparents lived it, and in the near future we very well may find out what it is first hand. I do believe that the system will hold together in some fashion that may be mostly on the surface. That’s the part we need to prepare for. Unfortunately, I think that there will be some severe changes in order to keep it going. They seem hesitant to increase the cap on SS taxes, but they probably will once they see a chance to push it through. Then we will see the age increase and benefits decrease. I guess you can tell that I don’t have a lot of faith in the ability of our politicians to think long-term. If it goes down on their watch, they will still find a way to blame others! I think, more than anything, this article shows us how devastating it will be to this country to lose SS. All of the above will happen plus the starting age will be bracketed up significantly over the next decade or more. The challenge is funding and demographics … and how to deal with the problem in a politically palatable way (a big issue). My advice – if you’re under 50, plan your finances as if there will be no Social Security for you. That means “self reliance,” radical or not. If you do end up getting something in benefits, it will be gravy. If you don’t, you’ll be ready. If you are 50-60, do what you can to shore up your finances and rely less on SSI than those 60 and above have planned for. There will not be an apocalypse, but this is just one of many programs that is statistically and economically unfeasible in the long run. The sooner we come to accept that and start changing course, the better for us all. Khaleef – That’s why I doubt we’ll lose it, at least entirely. I agree that political will is lacking and that’s why we’re facing the choices that we are. Politicians hate saying NO–it cramps their self styled image of omnipotence. Saying no in small steps over the past 20-30 years would have avoided hard choices in the future (meaning now). Sadly the blame will fall on current politicians when there’s plenty of blame to go back more than a few years. John – Another possibility is that it will be means tested, turning it into a welfare program. But whether it’s means tested or the retirement age is raised–70 is the number being tossed around now–many of the darker scenarios I listed above become possible. For many, the years from 65-70 are difficult financially and that could have broad implications. The reliability and predictability of SS have been major factors in the past 70 years and there will be consequences if those are suddenly in doubt. They will just continue to print money and pay benefits and let the future generations deal with the problems once they get big enough. I see this playing out almost exactly like it did in the ’80s. The government will wait until it reaches a “crisis” stage. Then, they will raise both the S.S. tax rate and the retirement age. Unfortunately, they won’t have the polical will to protect the OASI Trust Fund, which is what is really necessary to shore up Social Security. I wish the government would have acted a couple of years ago, when President Bush brought this up as a problem. Instead, reform was blocked and we are headed into the red, in the middle of a recession. This is going to make it more difficult to do what needs to be done. The good news is that France just got real and raised their retirement age. I expect a lot of countries to follow this lead. Although this is never popular, especially for people close to retirement age, it needs to be done. The retirement age isn’t keeping pace with life expectancy, especially in America. Bret – Unfortunately, no one, especially in politics wants to come forward with bad news. That’s why were in the situation we’re in. Hey, I know I missed the boat on this, but I still think it’s important to address some of these issues. Kevin M, you say that politicians have a hard time saying “no,” but that is exactly what both parties are doing right now. Right? There is a reason why the GOP is being called “The Party of ‘NO'” by the media. And, what about Tea Party members who have specifically stated that we need to get rid of Social Security and Medicare? Some of them have just made it into office–one of their goals while they are there is to phase out SS. I am worried that we as a nation have become too complacent, and we hope that our politicians won’t do this crazy stuff. But, hoping is different than taking action to ensure that it doesn’t happen. We have elected people who have railed against SS; now what? This article reminds me of the talk I use to have with my clients when I was working in financial services. When I would ask my clients what percentage of social security do you plan receive when you retire almost everyone would tell me nothing. The great thing about this is that it forces people to plan for the worse but hope for the best. In other words plan to live a full retirement on your 401k and IRA money and if social security is their when you retire call it a bonus for doing things right. At least that’s the way I look at it. Hi Chris–I’m not surprised at their assumptions. However…my thought is that the same factors that will cause the “bankruptcy” of Social Security will also cause 401k plans to fail. Social Security is a foundational program and it’s disappearance will be the result of cataclysms that will turn all of our financial assumptions upside down. Middle class retirement didn’t exist prior to Social Security and we can fully expect it to disappear if the program goes away. This country is spending money on everything including social security as if there was an unlimited supply of money. There isn’t. The unlimited supply will become little more than hyper- inflated and thus mostly worthless social security payments. The country is poorer today than it was fifty years ago. There aren’t enough young people to properly fund social security. This last comment is a little frightening but there might develop a political disconnect between the young and the old. Euthanasia might become the norm, at say 50. I told you it was frightening. Before you dismiss this notion out of hand, remember that life itself is not held in the high regard it once was. Expressions like it’s just a mass of cells might morph into its just a pile of wrinkles. Hi Mike, there has been some talk of “intergenerational warfare” but I don’t think that what you’ve described is exactly what anyone had in mind. I think we’ll mostly be paid in much less valuable dollars. That’s much easier and more politically feasable than euthanasia. What’s stunned me about the money printing course we’re on is that it’s gone on as long as it has. I guess when you can always come up with more money (via the Fed) and hand it out, you can keep things going for a very long time. I believe that pattern will continue, not the least of which since we’re all used to it. Heck, we’re running the government on trillion plus deficits every year and the sky hasn’t fallen. It’s more like a slow death where we all get poorer each year, but slowly enough that we’re some how OK with it. In theory, the government can always print more money, so in theory, the money supply is unlimited. It just doesn’t buy as much, and will buy a lot less in the future. That’s why I think social security will be there no matter what. As Joel Osteen said, “we become functional in our dysfunction”. That explains a lot of what’s wrong in the world. The money supply is limited by the life of the government itself. Spending at current rates is unsustainable. Right now about 40 cents on the dollar comes from external and politically unreliable sources. There is heightened polarization in the country. Some have referred to this as a nation of makers and a nation of takers. When the makers stop supporting the government, the government will collapse. The new government can and usually does repudiate the debt of the old regime. I know this is dim but our country is becoming too dysfunctional for conventional analysis. We need to start living within our means now, or these sad things will happen. I just signed up for SS. First check due to come in January. I don’t need it but I find I am turning into one of those people who are out for themselves. LOL. I do think that legislators will do something like means testing or further extending the age at which you can receive benefits. If a person is already receiving payments they probably won’t discontinue them, but they might raise the age from 62 to 65 before you get any benefits – reduced or otherwise. The 65 age has already been raised and probably will again. Now, the administration has just declared that all the illegal immigrants who Obama is allowing to stay will be able to get SS benefits even though they have not paid into the system. The fund will not be able to withstand 5 million additional payees unless something radical is done. Hi Kathy – Yeah, Social Security has turned into a massive give-away program to get votes. That’s a big part of the reason it’s so shaky. I’m a few years away, and even though the numbers I’m seeing from the Social Security Estimator show a very generous benefit, I continue to believe that it will be reduced. We’re not going to be able to dodge the fiscal train wreck much longer, and when cuts come they’ll be drastic. As it is, my full benefit age is 67, but I expect that will be extended to 70 before I get there. Um. No. All of government legitimacy rests on a social contract that we all enter into — explicitly or otherwise — through the constitution. We all agree that we need some sort of organization to make sure certain things (most to do with protection from other organizations, governmental or otherwise) are dealt with, recognizing the power that comes from coming together as a union, as opposed to trying to do everything on our own. Having gotten that off my chest: yes, you’re absolutely right, bottom line everyone needs to plan for a lower cash flow from Social Security than is seen today. And THAT does mean taking on a greater personal responsibility to set aside a savings to take care of the retirement years. Hi David – I respect your disagreement with my point about government legitimacy, but let Social Security checks stop going out, and the whole construct will be on wobbly knees. Nothing so incites the masses more than the withdrawal of their sustenance. The Romans understood this well, and maintained a policy of “bread and circuses” to keep the masses quiet. The very strength of organization is the sense that people are getting benefits from it. If they aren’t, the whole thing could collapse and rather quickly I’m afraid. The Social Security actually benefits by people choosing to start receiving payments at 62. I think Detroit has shown what can happen when people are covered by a local and not national retirement plan. Those Tea Party policticians are lost in the 1950’s. I agree Sammie, we need some sort of national retirement system. Social Security is one of the few remaining systems that levels the economic playing field. Even as a libertarian myself, I’ll be the first to admit that most people are unlikely to save for retirement, either because of limited circumstances or because of other priorities. The real problem is the way the system is managed. Still, the government will keep it held together with tape and glue no matter what, it is will be there in some form or fashion.